I've been writing about my road trip across Malaysia these past couple of weeks and have been terribly missing the freedom of the open highways as I relive those moments in my blog posts. Truly nothing beats the type of camaraderie shared between friends when faced with far-off destinations. The excitement is unlike any other and I can't wait to hit the road again. Wanna go on an adventure with your friends as well? Here's your chance! Drive to Caltex and enjoy an unbeatable barkada deal. 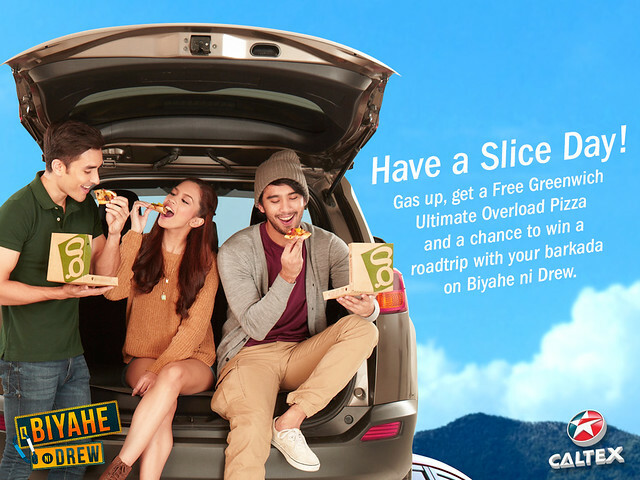 Gas up, get a FREE Greenwich Ultimate Overload Pizza and a chance to win a roadtrip with your barkada on “Biyahe ni Drew”! For every P1,000 single-receipt purchase of Gold with Techron, Silver with Techron and Diesel with Techron D products at Caltex, you will get (1) one pizza stub. Collect (3) three pizza stubs and exchange them for a Greenwich coupon from any participating Caltex Stations. It doesn't end there! Using your Greenwich coupon, you can get a chance to win an ultimate roadtrip with your barkada!